Confirming what many suspected when they saw the final checklist for 2015 Topps Chrome Baseball, the high-number rookie cards are all short prints. 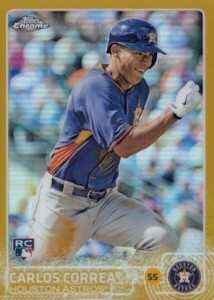 Featuring five of the more recent call-ups, the SP cards are already seeing tremendous interest from collectors. 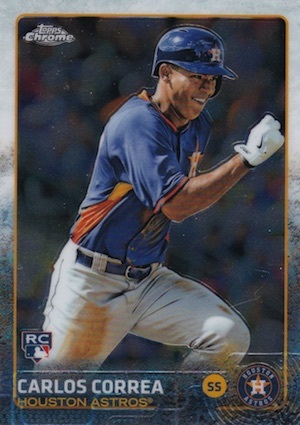 Originally slated for a 200-card base set, 2015 Topps Chrome Baseball grew by five cards when the full checklist was revealed. Although hobby did not officially release until 8/19, retail began popping up early and collectors got their first taste of the rookie cards for Carlos Correa, Byron Buxton, Joey Gallo, Noah Syndergaard and Francisco Lindor. 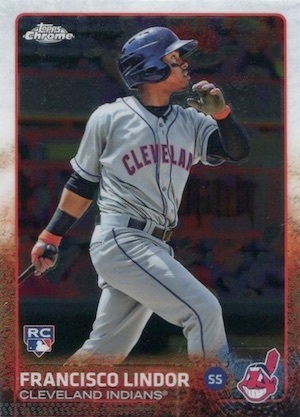 Shop for 2015 Topps Chrome Baseball Rookie Card Short Prints on eBay. 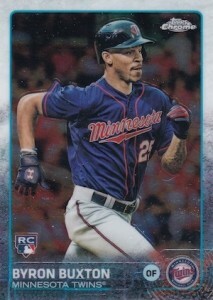 Tougher to pull compared to the other base cards, the more limited nature of the five cards was not officially confirmed until Topps acknowledged the short prints in their Topps Talk podcast. While they touch on a number of hobby topics in the show, they start the podcast with Chrome Baseball. 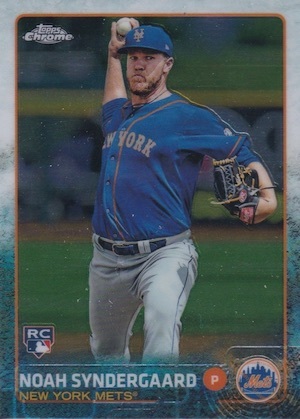 Summing the segment up, Topps Chrome brand manager Zvee Geffen described it as "a blessing and curse" in regards to the late-season additions to the product which required them to "go back to press" to add in the new subjects. While specific ratios were not provided, Geffen mentioned that "they won't fall quite as frequently as a few of the others." Ambiguity aside and regardless of the actual rarity, the cards aren't surfacing in huge numbers and the values remain solid. As more enter the marketplace, they are starting to cool off after a hot start. 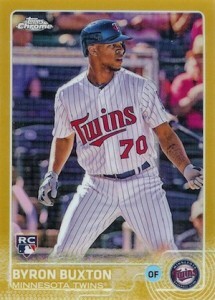 In addition to the base cards for the five players, Green (#/99) and Gold (#/50) Refractor parallels have also been spotted. No word yet on whether there are more colors to be found. 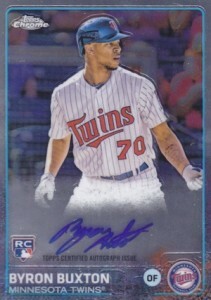 One thing that stands out is that the Refractor parallels for Byron Buxton are different from the base short prints and actually feature the image from his signed 2015 Topps Chrome Baseball card. 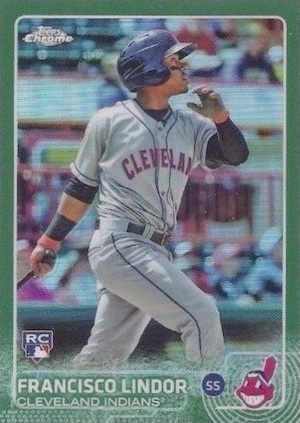 Although not officially an image variation based on the ten cards confirmed by Topps, the rare card does seem to fit the description as an unannounced 11th variation. However, it does not match up with the celebration theme. 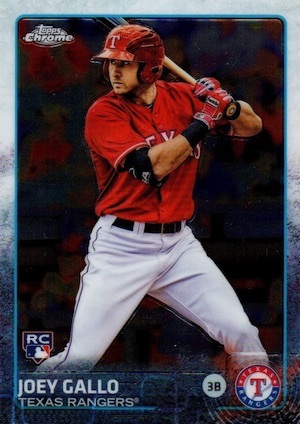 View all five of the 2015 Topps Chrome RC short prints below. 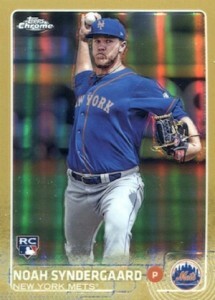 Syndergaard and Lindor also have signed cards in the product. 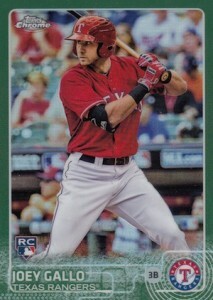 Found a green Correa parallel on eBay. Bring your wallet if you want one of those guys.